This stunning sterling silver and 9ct rose gold ring is a celebration of the magical Preseli Bluestones, only found in the Preseli Hills of Pembrokeshire and used in the building of Stonehenge. All Clogau Welsh jewellery contains a touch of gold mined from the Clogau St David's gold mine - the very same gold used in generations of royal jewellery. Clogau Gold Tree Of Life Silver Preseli Bluestone Ring is rated 5.0 out of 5 by 1. Rated 5 out of 5 by Anonymous from Something different A really unique ring, purchased for half the price it is being sold for elsewhere. Lovely detail underneath the ring too. Something special when you can’t afford the price of a sparkling something special. 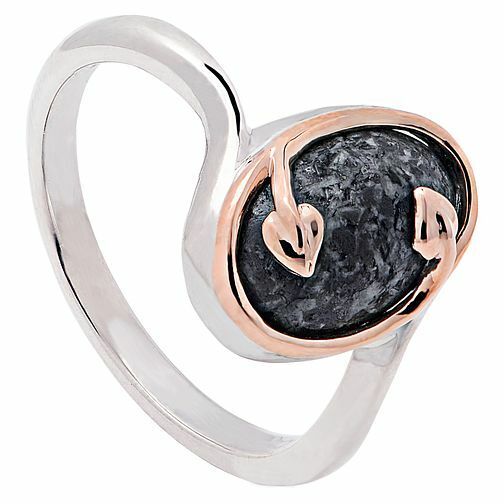 I’m impressed with the originality and whole range of Clogau. My first Clogau buy, but won’t be my last.